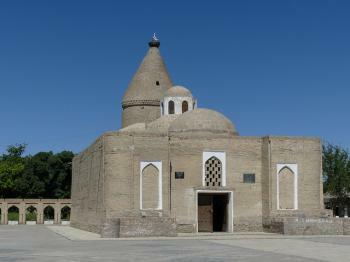 Chashma-Ayub Mausoleum is part of the Tentative list of Uzbekistan in order to qualify for inclusion in the World Heritage List. I visited this tentative WHS in June 2017. Ideally it would be included as an extension to Bukhara and not as a separate WHS. That way it would stand more of chance. There is a UNESCO plaque outside as if it were already inscribed, which is something quite common in Central Asia - you either find no trace of the sites' inscription (like in Samarkand) or else the UNESCO symbol is paraded everywhere even where it shouldn't be (like in Chor Bakr). The exterior would be a valid extension of Bukhara's WHS. On the other hand the mausoleum now houses a very interesting museum on water management in Bukhara and the information provided could easily be beefed up into a nomination file for yet another water management system like Iran's qanats or the UAE/Oman's aflaj system. It is a worthwhile stop next to the local market, however I'd argue in favour of removing the fake stork statue placed on the restored conical dome if this site is ever to be included on the WH list.